The general idea’s still the same though. 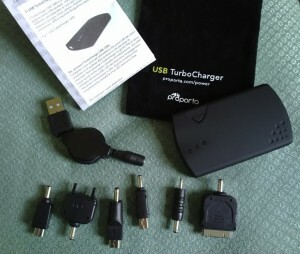 You charge the USB TurboCharger 1200 up from any convenient USB source – either a computer’s USB port or one of Proporta’s own 12V or mains-to-USB adapters (incidentally these latter two come with the recommended ‘World Pack’ version of the product, along with a range of international mains pin converters), and then you can dispense this to just about any portable device, be it a Nokia, Sony Ericsson or Apple phone, be it a Nintendo DS Lite or even just something that charges over microUSB or miniUSB. Discharging the USB TurboCharger 1200 is done by hooking things up using the supplied USB lead and one of the connectors. While charging, the three LEDs on this surface animate to indicate power going in – the animation stops when the accessory is fully charged. When dispensing charge, you can press the top surface button to light the three LEDs, giving you a rough idea of how much charge is left in the battery. 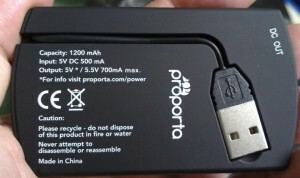 It’s a system that has worked well for travellers over the last few years, although my main concern here was the relatively low capacity – 1200mAh is about the same as that in a typical smartphone (e.g. the Nokia N86 8MP that I used as my guinea pig device, though there’s an iPhone/iPod connector included and this could equally well have been an iPhone), but the transfer of charge is never 100% efficient and I’d expect the actual charge imparted to max out at about 900mAh, not enough to fully charge the battery of any current smartphone. However, depending on model of phone, it’ll get you to between 60% and 80% of capacity, certainly enough to keep you phoning, texting, browsing and twittering for a while longer. 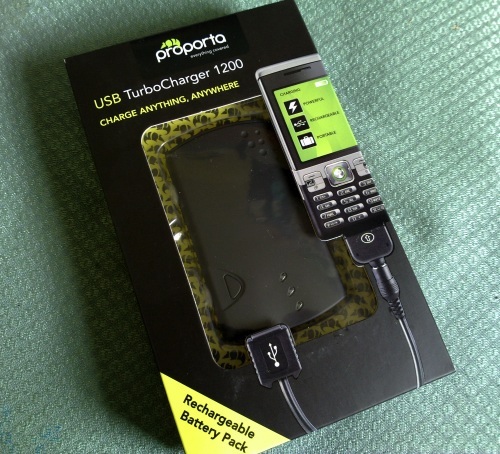 In my main test, I took the phone down to about one ‘bar’ of battery life and then plugged in the USB TurboCharger 1200. The phone popped up ‘Not charging’. I’ve seen this before – and so have Proporta, for there’s a special (labeled) switch on the side of the TurboCharger 1200 that toggles the output voltage up to 5.5V, a voltage at which Nokia smartphones seem much happier. Charging was now proceeding properly. The accessory is rated at 700mA output, so, allowing for a little inefficiency, I’d expect to get the phone up to about 75% charge in under two hours. The TurboCharger 1200 ran quite warm for the first hour (there’s the aforementioned inefficiency in action!) and then settled down to trickle charge – in fact, the trickle charging seemed to be going on forever and I stopped it at the two hour mark – by this time, no LEDs showed on the ‘power meter’ and I suspected no actual charging was still happening (despite the phone’s battery meter still animating). Removing the charger, the test N86 showed six bars out of seven, but this dropped fairly quickly in real life use and (in typical non-linear Nokia battery gauge fashion) I’d estimate that in fact the battery had been charged to about 60%. Of special note in this iteration of Proporta’s charger, besides the tiny size (it has the same plan dimensions as a standard credit card!) is the way the charge-in lead is hard wired and stowed within the body of the accessory. This saves fiddling around when you’re snatching 30 minutes of charge from a friend’s laptop while mobile, for example. You simply take the charger out of your pocket, snap out the connector and you’re in. Each of the Proporta chargers ‘do what they say on the tin’, but it’s absolutely essential to bear in mind the capacities involved and to try to be patient with the laws of physics. This smaller version of the charger will only realistically give you just over half a charge, will take an hour (at least) to deliver it, and will take an hour (or two or three or more, depending on the USB current limitations of the machine you’re using) to charge back up again. Although the size is impressive, these electrical limitations make it less suitable for the true road warrior than its bigger 3400mAh brother (review coming soon) – with such a big capacity (around two full charges of most phones), allowing the TurboCharger to charge itself overnight is understandable and at least you’ll know you’re good to go for a few days. So, if space is at a premium in your pockets, this will get you out of a scrape, albeit at greater cost than simply having a spare, charged phone battery. Mind you, this will charge anything that runs down, so will also help out when your daughter’s DS runs out of steam. But if you can handle something of twice the volume then you’ll find the TurboCharger 3400 gives you far more capacity and options.